Cinco de Mayo Archives - Bring It! Some days we have difficult choices. Saturday will be one such day. Do you wear a fine hat and celebrate the first Saturday in May according to Kentucky tradition, or do you scarf down some tacos and join the Cinco de Mayo party? Or, do you do the sensible thing and celebrate both? Well duh! I do not normally do this, but I am posting two untried recipes. Whyyyyyy? Because it’s important! Because it’s Kentucky Derby Day and Cinco de Mayo AND its almost summer. That means it’s high time to get your guac on. I am a wing it kind of guac maker. As a Californian that is my birthright. That said, you can always improve. These two new takes on guac are both from Mexican food jefe Roberto Santibañez by way of Food52. The first is unique in approach but features totally classic ingredients. It hits all the must haves and nothing more: lime, cilantro, jalapeño, onion are all pulverized FIRST then added to avocados. As Santibañez says, “There is a very important textural thing to guacamole — we never really mush up the avocado.” I knew I liked this guy. I really felt the love though when I read about his second creation, which is totally wacky. It involves a splash of tequila (he had me there), apples (hello New England) and pecans (a nod to the America south and more weirdness). My awesome neighbor just came back from Georgia bearing two bags of pecans that she harvested and shelled herself. Fate. Kismet. Weird guacamole. Anyway, here are the recipes. I will be making and testing them both on Saturday, celebrating both occasions of course. If you do the same please tell me what you think and we can discuss. Whatever you choose to celebrate, have a fantabulous weekend! P.S. Post time is 6:12. For the worst odds and the best name I’m taking Patrona Margarita, with 50-1. Mash the onion, chile, salt (the coarseness of kosher salt helps you make the paste), and half of the cilantro to a paste in a molcajete or other mortar. You can also mince and mash the ingredients together on a cutting board with a large knife or a fork, and then transfer the paste to a bowl. Score the flesh in the avocado halves in a crosshatch pattern (not through the skin) with a knife and then scoop it with a spoon into the mortar or bowl. Toss well (it should be like salad properly dressed in vinaigrette), then add the rest of the cilantro and mash very coarsely with a pestle or a fork. Season to taste with lime juice (if you’d like) and additional chile and salt. 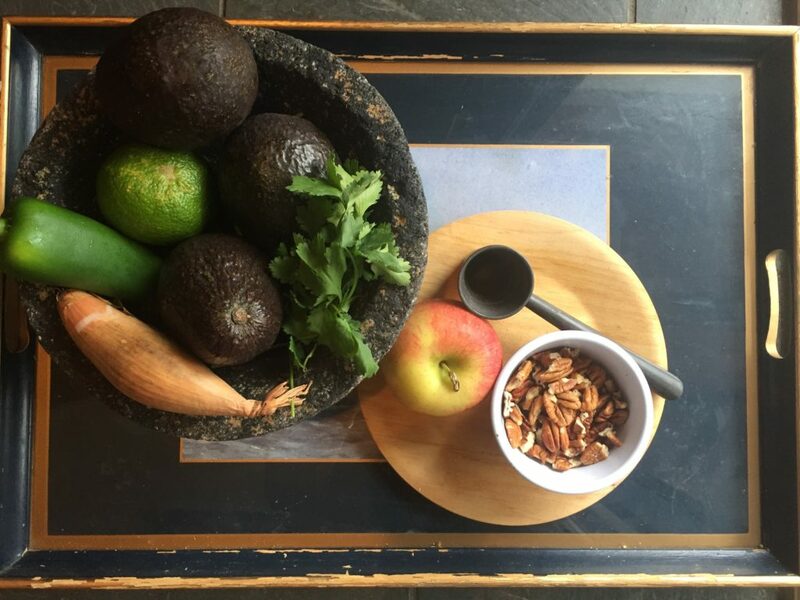 Author Notes: Roberto says:” The apple needs to be sweet and crunchy (not Granny Smith-tart) and diced not too fine, to contrast just vocally enough with the guac’s salty heat and richness. The pecans should be tossed in butter after toasting, not before, so you get fresh, unbrowned butter flavor, too. Adapted slightly from Truly Mexican (Houghton Mifflin Harcourt, 2011). Toss the apple with the tequila and lime juice in a bowl and let the mixture stand for 30 minutes to 1 hour. Heat the oven or toaster oven to 350° F. Spread the pecans on a small baking pan and bake until golden and fragrant, 7 to 8 minutes. Add the butter to the pan and toss to melt the butter and coat the pecans. Sprinkle with salt, tossing to coat. Heat a comal, griddle, or heavy skillet over medium-low heat and roast the chile, turning it over with tongs once or twice, until tender, blistered all over, and blackened in spots, 10 to 15 minutes. Once cool enough to handle, remove the skin from the chile (you might have to use a paring knife). Mash the chile, onion, salt (the coarseness of the kosher salt will help you make the paste), and 2 tablespoons of the cilantro to a paste in a molcajete or other mortar. You can also mince and mash the ingredients together on a cutting board with a large knife, and then transfer the paste to a bowl. Score the flesh in the avocado halves in a crosshatch pattern (not through the skin) with a knife and then scoop it with the spoon into the mortar or bowl. 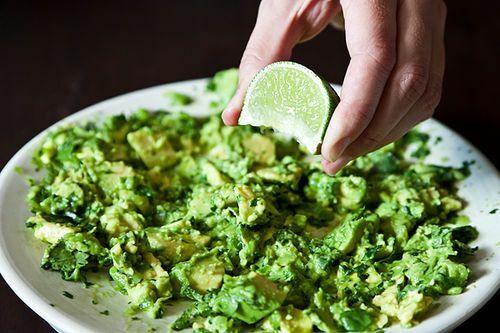 Toss well, mashing the avocado coarsely with a pestle or fork, taking care to keep the avocado chunky. Gently stir in the apple mixture and most of the pecans just until it holds together. Garnish with the remaining pecans and cilantro. Serve right away with tortilla chips. This entry was posted in Apres Anything, Occasions, Start it up, Uncategorized and tagged Cinco de Mayo, guacamole, Kentucky Derby on May 4, 2018 by Edie Morgan. With this in your house, how can your weekend go wrong? What we have here, my friends, is a dream Double Header. Cinco de Mayo and the Kentucky Derby, on successive non-school nights. If there was ever a time to have a cool, refreshing drink in your hand (and a snazzy hat on your head) this is it. In honor of creative cocktails and mocktails, below are two infused simple syrups that will give your drinks a fresh twist appropriate for the upcoming occasions. And what the hell—keep scrolling for a few cocktail concoctions as well, though they are only a starting point. Don’t be afraid of using the jalapeno syrup in your mint julep (or even subbing cilantro for the mint) for some south of the border cha-cha. Have fun and if you’re placing bets, good luck! In a small saucepan over high heat, combine 1 cup water, sugar, and jalapeños. Bring to a boil, stirring to dissolve sugar. Reduce heat to medium and allow to simmer to three to four minutes, stirring frequently. Remove from heat and let steep 20 minutes. Combine water and sugar in a saucepan, and bring it to a slow boil while stirring continuously until all the sugar has dissolved. Just as the mixture begins to boil, add 1 cup of fresh cilantro. Simmer for 5-10 minutes and let cool (this syrup will keep in your fridge for about a month. More if you add a capful of vodka). Now how do we use them? Below are two ideas, but this is no time to follow directions. Use these in whatever cocktail or mocktail could use some salsa sass. ICE! Don’t be shy here. Shake well for twenty seconds and then strain* into a lowball glass filled with ice. Garnish with a wheel of cucumber and a sprig of cilantro. *brave multi taskers, fans of zero waste, and those desperate for a meal idea because they spent so much time prepping cocktails will love this: fully drain the remaining cucumber and cilantro shrapnel and mix it in with Chinese noodles, a few more veggies and soy dressing for a summery salad. 1 ounce Reposado tequila and 6-8 slices of jalapeno (seeds removed). Shake it like you mean it, then strain into a cocktail glass. Garnish with a slice of lime, a slice of jalapeno and a sprig of cilantro. Stir together with ice in a large pitcher and pour into 8 glasses. This entry was posted in Sips and Slurps, Start it up, Uncategorized and tagged cilantro cocktails, cilantro simple syrup, Cinco de Mayo, jalapeno margaritas, jlapeno simple syrup, Kentucky Derby on May 5, 2017 by Edie Morgan. A picture of restraint. Pineapple salsa with Taco Works chips, imported from San Luis Obispo, CA. At left, all the ingredients that did not go into it. What? Don’t tell me you forgot it was Cinco de Mayo. True, having it fall on a Tuesday is just plain sad (see Marcharitas and weep). Sadder yet is that this is the very first time I realized my birthday day of the week syncs up with Cinco de Mayo. I’m not sure what that means, but it must have something to do with a cicada-like cyclical intensity of birthday season. Regardless, it’s tough to rally for a Tuesday. A responsible amount of fresh cilantro (a healthy handful), chopped. Go with your gut on this. And if you hate cilantro (Beatie) grab some mint instead. Put the pineapple in the food processor and pulse until all the big chunks are gone and it is the consistency you can imagine eating. Pour the pineapple into a bowl. Put the onion, jalapeno, ginger and cilantro in the processor and pulse until desired, edible consistency. Scrape those veggies into the pineapple. Stir in syrup (if desired) and lime juice. Add salt to taste. Enjoy with chips, on fish or chicken, on a sandwich, on a spoon…whatever. And while you’re staring at the jicama you didn’t use, cut that baby up and squeeze the other half of the lime over it so you have another thing to dip in the salsa. Happy Cinco de Mayo. May it make your Friday come all the faster! This entry was posted in Appetizers, Apres Anything, Start it up and tagged appetizers, Cinco de Mayo, mexican food, pineapple salsa on May 5, 2015 by Edie Morgan.